Ready for a fresh look? 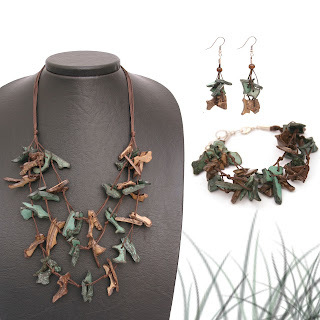 This set will bring to mind the cool breezes, soft sand, and grandiose landscapes that make up the Mediterranean coastlines. 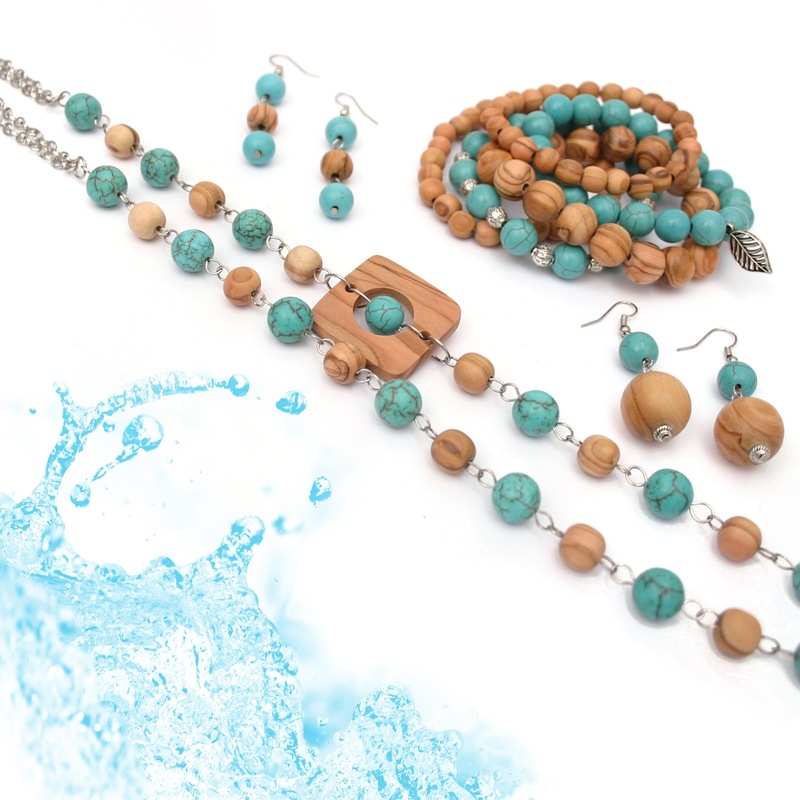 Breathtaking semi-precious turquoise stones alternate with our signature olive wood beads to bring you a simple yet elegant conversation piece. 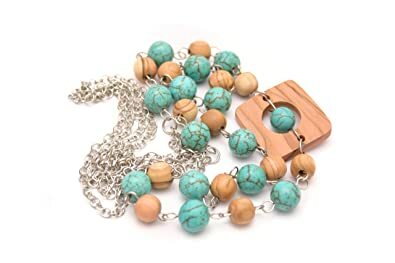 To lend a modern twist to this necklace design, a square olive wood ornament hangs asymmetrically, encircling a single turquoise stone. 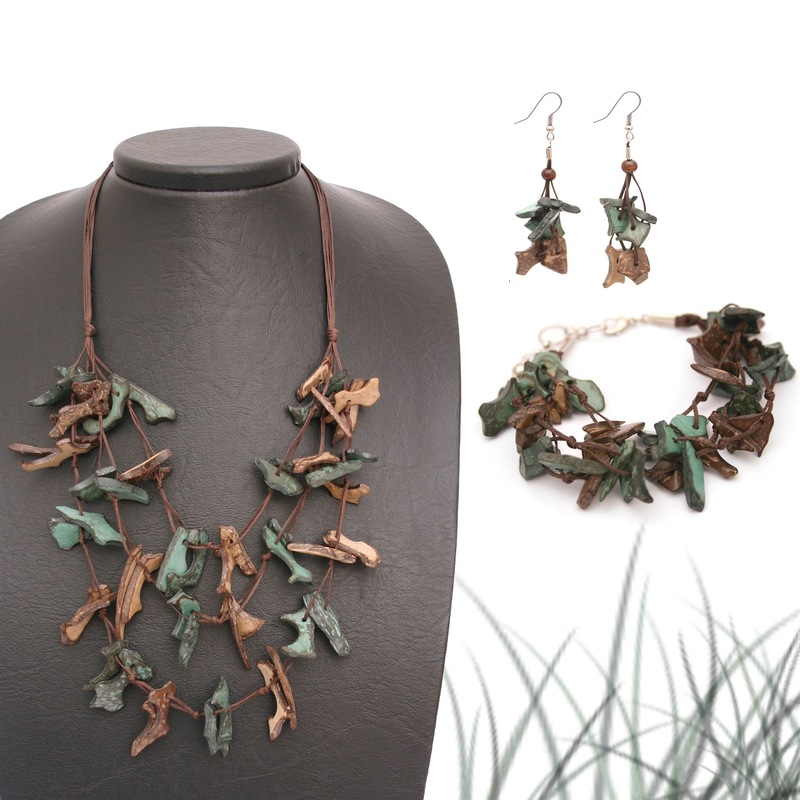 The Mediterranean Necklace measures 82 cm (32 inches), easily slipping over the head. Light and airy enough for all day at the office or a long stroll on the beach, our Mediterranean Breeze Essential Earrings bring color and sophistication to your favorite ensemble. 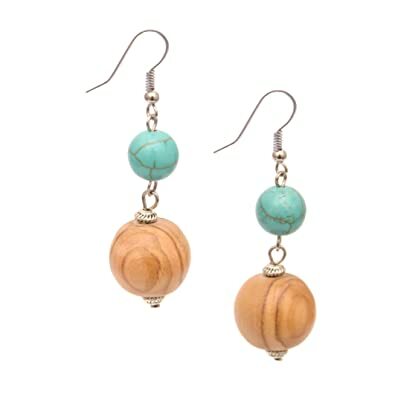 The Mediterranean Breeze Essential Earrings measure 5 cm (2 inches). Simple yet beautiful, the Mediterranean Breeze Dangle Earrings elongate and brighten the face with smooth turquoise stones and hand-sanded olive wood beads. Following the trend of the season, pair these earrings with a chunky layered bracelet like the Mediterranean Breeze Bracelet. 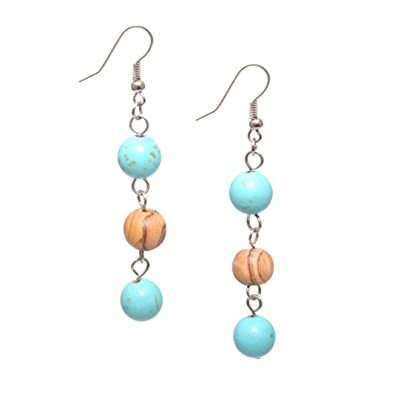 The Mediterranean Breeze Dangle Earrings measure 6 cm (2 inches). 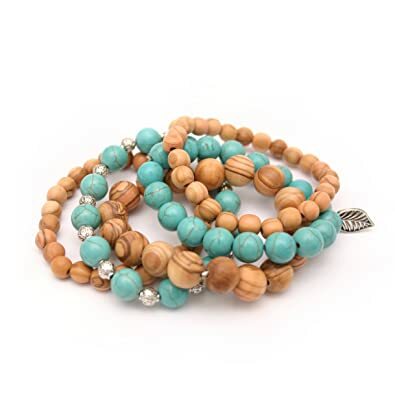 Designed to be worn together, this set of five individual bracelets adds versatility and style to your wardrobe by combining two layers of smooth turquoise stones with metal embellishments and three strands of hand-sanded olive wood beads. 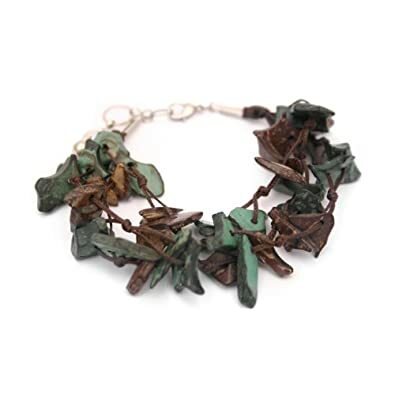 Each strand of the Mediterranean Breeze Bracelet measures 19 cm (7 inches) in circumference. 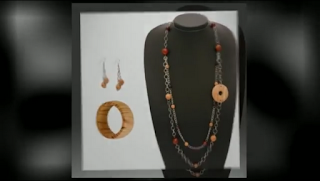 The stretch of the bracelet allows for easy wear. Remember that behind each From The Earth product there is a valuable life. From The Earth is a member of the Fair Trade Federation. From The Earth would like to introduce you to our latest Partner. Their products are already in our Amman showroom and will soon be available on an Amazon near you. Meet two people who are serious about clean. Issa and Marilyn Makdah started their soap making business when they couldn’t find what they needed – an all-natural olive oil soap. Being the multi-talented man that he is, Issa researched olive oil soap manufacturers. He found that the olive oil being used in “natural” olive oil soaps was crude olive oil, a perfect name for this particular product. But not what Issa had in mind when he envisioned “natural” olive oil soap. Issa took action by creating his own natural olive oil soap using food-grade olive oil. In fact, all of the ingredients in the Makdah family soaps, except the essential oils, are food-grade ingredients. Together, he and his wife Marilyn began pursuing their dream to have truly natural, quality olive oil soaps available in Jordan. From The Earth found this amazing couple at a local souq. Our partnership developed quickly after we tried and fell in love with their products. We love the Makdah’s passion for natural olive oil soaps produced in Jordan and they love our passion for assisting local artisans grow their businesses under a fair trade business model. By partnering, we can reach the Makdah’s dream and go beyond by opening markets for them around the world. Because of our partnership, now you too can benefit from using truly natural olive oil soap. Think about this. Your body will eventually ingest everything that goes on your skin. Shouldn’t what you put on your skin be good for your entire body? Who knew recycled coconut shells could look so classy? Part of the Rendezvous Around the World collection, the Island Rhythm set will give you the island escape that you have been seeking. Once you don this light and carefree piece, you'll be moving to the exotic rhythms of the tropical seas. 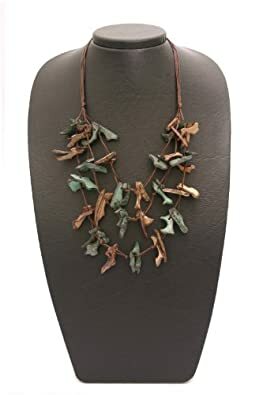 This exceptional necklace goes from a weekend at home to a weekend away without skipping a beat. 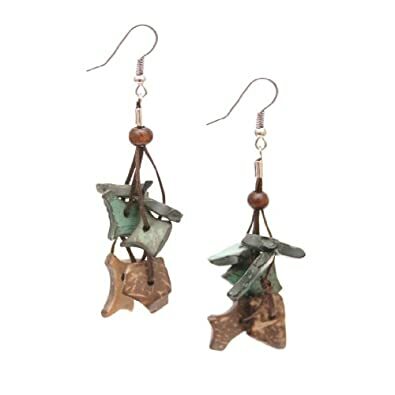 Close your eyes and these unique loop-styled earrings can take you to a place where the sand is warm and the breezes are cool. Put exotic rhythms of the Islands to your hands by wearing this beautifully crafted light and carefree bracelet.